A week after my nineth birthday I was given the rite of passage to ride my bike all 1.3 miles, without an adult, to the general store in my sleepy South Shore hometown. It’s hard to believe that it has been ten years since Meryl Streep and Amanda Seyfried first graced the screen as the dynamic mother-daughter duo of Donna and Sophie whom we’ve come to know in love in the original Mamma Mia! 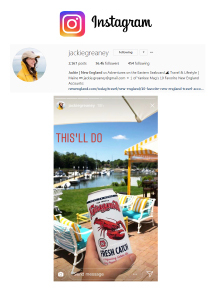 New England Instagram Influencer Jackie Greaney featured Fresh Catch, the latest release from Narragansett Beer, on her Instagram Story during her holiday trip, tagging @GansettBeer.